This is a question now being asked by more American homeowners than ever before, and the answer is not the same for everyone. 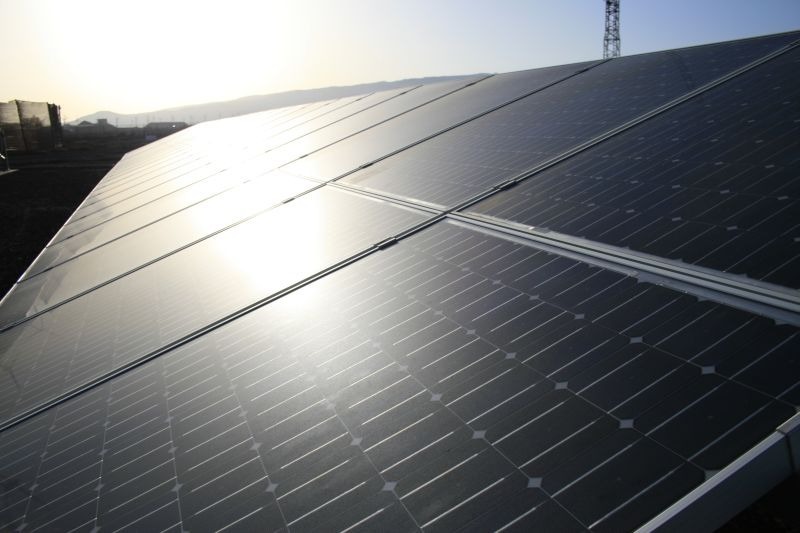 According to the Solar Energy Industries Association (SEIA), more than 600,000 residential and commercial properties in the United States have solar panels. The SEIA further notes that almost one-third of these properties had their solar panels installed in 2014, which is not surprising when you consider the incredible 50+% growth in residential solar seen in 2012, 2013 and 2014. In these same years, California ranked number one in installations, installing significantly more megawatts than the distant second each year (Arizona in 2012 and 2013; North Carolina in 2014). It is easy to assume that this might be fueled by our favorable number of sunny days each year or the fact that there are so many large, high-end homes and properties to power, but it is interesting to note that we rank fifth in estimated solar energy system performance and we are near the bottom of the list when it comes to annual electricity consumption per home. So why do we rank so high in solar system installations when homeowners in other states may be better poised to benefit even more than Californians? The SEIA notes that ramped up sales efforts, faster installation processes and the approval of significant increases in electricity rates are two of the reasons for our state’s growth, but it is, perhaps, the last reason they note that may continue to be the most influential: improved financing programs. In fact, Property Assessed Clean Energy (PACE) and other solar financing options are the primary reason that the SEIA notes that California is poised to rank number one for solar system installations again this year. This does not mean that every homeowner interested in solar energy would rather buy than lease or enter into Power Purchase Agreements (PPAs). Both have pros and cons, and each will appeal to particular homeowners for different reasons. According to EnergySage, the majority of residential solar systems currently installed in California are the result of leases and PPAs, but this could change with the increasing availability and appeal of solar financing options. In particular, as more homeowners become aware of the energy-efficient home improvement possibilities offered through the HERO program, we may see an even greater shift towards solar panel ownership. The first question you should ask is whether or not switching to solar energy is right for you. Installing solar panels is a big investment — if you purchase them — and is a long-term commitment whether you purchase or lease them. The solar panel salespeople that you have probably encountered at least once on a trip to Home Depot or Lowes usually start by asking if you pay more than $150 per month on electricity. While this seems to be the threshold by which many homeowners determine whether or not solar is right for them, the picture below shows that you can experience significant savings, even if your electricity bill is less than $150 per month. There are lots of estimators online that will show you your potential savings if you choose to go solar, but I particularly like this one on the EnergySage website, because it takes into account roof size and orientation, shading on your roof, electricity rates, available rebates and incentives where you live, and current market price data. 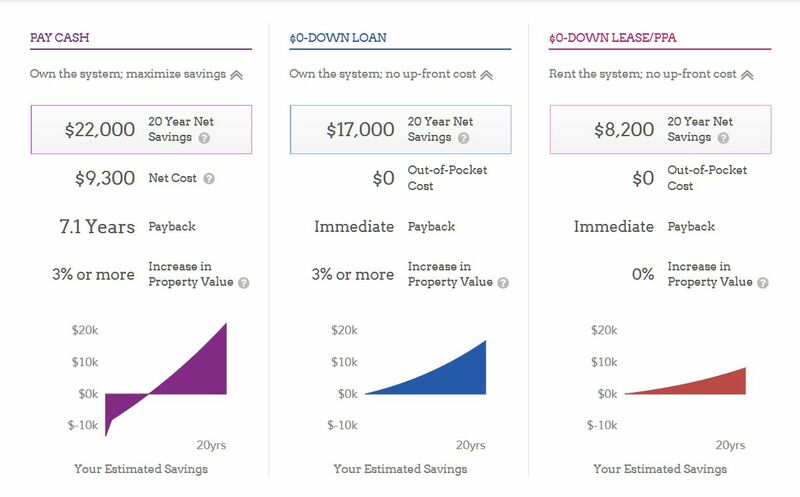 All you have to do is type in your street address and an estimate of how much your electricity bill is each month, and you can get instant results showing an estimate of how much a solar energy system would cost for your home, how much you can save, when you will begin to experience those savings and even how much the value of your home could increase. The results below are for a home with an electricity bill of just $100 per month, which shows that even homeowners with lower utility bills can experience savings by going solar. This, of course, is aside from the added benefit of lowering your home’s carbon footprint and taking a big step towards lowering your overall environmental impact. Going solar can increase your property value, eliminate or reduce your electricity bill, help you avoid impending increases in energy costs, increase your property’s appeal to potential future buyers, lower your carbon footprint and help you do your part in the country’s overall move towards energy independence. As an added bonus, California is among the states that have designated solar panels as exempt from property tax, which means that you can increase your home’s potential resale value without increasing your property tax rate. Historically, one of the biggest challenges homeowners faced when deciding whether or not to go solar was the price of installing a solar energy system. The belief that solar panels were so expensive to install that it would take far too long to see a return on the investment — if they saw one at all — has kept many homeowners from going this route. Between rebates, incentives, improved financing options and zero-down lease options, this simply is not the case. As you can see in the estimate snapshot included above, the estimator shows that solar panels installed on that house would pay for themselves in just seven years. If we assume the solar panels will stay in working order through at least the 25 years for which most solar panel systems have a warranty, this could mean nearly 17 years of free energy (or at least a significantly reduced bill). 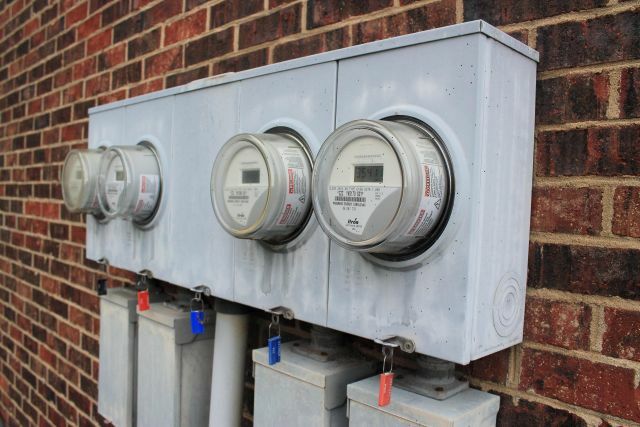 Also keep in mind that, if you purchase your solar energy system, the 30% federal tax credit and the significant reduction (or elimination) of your monthly electricity bill give you an impressive jumpstart at realizing the return on your investment. And, if you lease your system with no down payment, you can immediately start enjoying a reduced monthly bill with no additional out-of-pocket expense. Now that your internal environmentalist and your internal penny pincher have agreed that solar energy is right for you, you will need to decide whether you want to purchase your system, lease it, or purchase the power generated by a third-party owned system. There are pros and cons for each option, and each is the right choice for some homeowners. 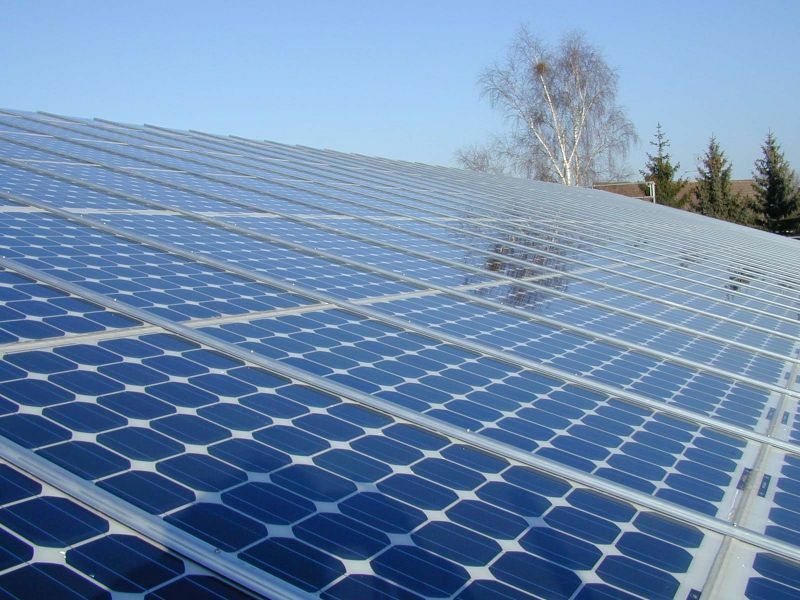 Purchasing solar panels by paying for them upfront or financing them is generally considered the better option for homeowners who can afford to go this route. While homeowners who purchase their systems are responsible for repairs and maintenance, it should be noted that there is little maintenance involved and most systems come with a 25-year warranty. It is also important to note that low credit scores may disqualify some homeowners from leasing a system or obtaining certain solar loans; however, the HERO program — which provides financing that is not tied to your credit score — may be a game changer for homeowners with poor credit. How Can HERO Financing Help Homeowners Purchase Solar Panels? If possible, it is generally considered preferable to purchase your solar energy system, which allows you to experience the greatest potential benefits and, in some cases, enjoy anywhere from about 15 to 40 years of free energy. However, not everyone can afford to pay cash for solar panels or qualify for solar financing programs that partially base the decision on your credit score. Additionally, while some homeowners may be interested in lowering their carbon footprint, they might not think it is worth the tradeoff to have another loan on their credit report and affecting their credit score. The Home Energy Renovation Opportunity Program — more often called the HERO program — offers an alternative financing option that may be the answer for homeowners who are on the fence about purchasing solar panels. The HERO Program, which was created by Renovate America and made possible by the passage of PACE (Property Assessed Clean Energy legislation), offers financing for projects that make your home more energy efficient or water efficient. Loan amounts are based on the amount of equity you have in your home, no down payment is required, credit scores are not a factor, the loans have competitive, fixed interest rates, and the loan is attached to your home as a tax assessment — which means your payment becomes part of your property tax bill. If you are planning on selling your home, a HERO loan can help you increase the value of your home by making this or other improvements and, in some cases, the remainder of the loan can be transferred to the buyer upon completion of the sale. You can use a HERO loan for more than one home improvement project, as long as the contractors and products you use are approved for funding through this program. This means that you can use this program to finance your solar energy system, as well as other energy- or water-saving improvements. Because this loan program is specific to eco-friendly home improvement projects, even homeowners who can afford to pay cash for a solar energy system may want to consider using a HERO loan for their solar panels and saving their cash for other projects that are not eligible for HERO financing. If you are interested in learning more about HERO loans, start by confirming your home’s eligibility and finding a San Diego solar panel installer that is on their list of approved contractors. Did you purchase or lease your solar panels? Which factors helped you decide which was right for your?